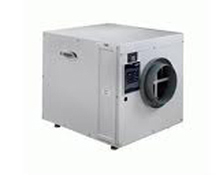 Aprilaire Dehumidifiers are high quality, heavy duty units manufactured in the USA to commercial standards to control humidity throughout the whole home or in a crawl space. In consumer reviews these products are consistently praised and given high ratings by users. Whole home models are much more expensive than a typical portable. Unlike a portable, which is a stand-alone unit, the whole home type is installed as an addition to you existing HVAC system and operates through the existing ducting. The appliance is installed alongside your furnace or air conditioning unit, most often in the basement, crawl space or attic of your home. Because the ambient temperature often varies more in these areas than in the living spaces a whole house model has to perform effectively across an extreme range of temperatures and must function in very cool as well as very warm conditions. In addition a whole home unit has to be energy efficient and long lasting. For all these reasons the design and build quality of all components is to a much higher standard than any portable model. In this respect a whole home dehumidifier is very similar to a model designed for use in a basement and, indeed, all Aprilaire dehumidifiers can be used as basement or crawl space units and frequently are. 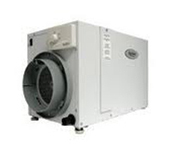 The Aprilaire Dehumidifier is manufactured by Research Products of Madison, Wisconsin. The company was founded in 1938 and the Aprilaire brand was initially applied, in 1954, to a humidifier with evaporative, flow-through-design, the first of its kind. Research Products developed additional models to expand the range and diversified into a variety of other air quality products, including those for humidity control. Today Aprilaire is one of the most respected brands in the market for these appliances. The Aprilaire 1730A whole home dehumidifier is the smallest and lowest capacity model in the Aprilaire Dehumidifier range. If you occupy an apartment or smaller house with a total floor area not exceeding 1400 square feet the 1730A is one of the models you may wish to consider. This unit has some advantages you may appreciate. It is, perhaps, one of the best choices for those of you who have only a small and awkward space in which to have a whole home unit installed. The 1730A is compact, has multiple ducting configurations and can be hung from a convenient spot if this is your preferred option. On the other hand this model is neither as quiet nor as energy efficient as I would have expected a model from this manufacturer to be and is not Energy Star qualified. If your main problem is not "how the heck do I get one of these things into my home?" you may find other models of similar capacity meet your needs more completely. You can find out more by reading my review and make up your own mind. The Aprilaire Dehumidifier 1750A is one of a small number of whole home models available in the USA. If your home is no more than 2200 square feet in total this is a machine which I strongly urge you to consider before making your selection. Perhaps one of the most appreciated features of this appliance is the operational flexibility it provides. With the 1750A you may for example use the localized control function to keep a particular eye on and control the moisture level of a specific room of your house. When your air-con or heating is not running you can still use the unit to control humidity in a particularly moist area, such as your basement. You may even use this model to provide fresh air ventilation when you need it. Of course the 1750A does have strong competition and you will want to look at the alternatives to pick just the right model for your home. Each has their particular strengths and you have your own priorities. Why not take a look at my review to find out a little more about this highly regarded appliance. 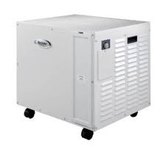 The Aprilaire Dehumidifier 1770A is the highest capacity unit in this three model range. Its moisture extraction rate is 50% higher than that of the 1750A and it is suitable for homes of nearly 3000 square feet total floor area. This model is a capable, well made appliance and, as consumer reviews confirm, you may rely on it to do a good job in keeping your home free of excessive moisture, comfortable for your family and safe from mold and its unpleasant consequences. Like the 1750A this unit offers exceptional operational flexibility and that flexibility is undoubtedly its most attractive feature. In other respects the 1770A offers little other than quieter operation to distinguish it from the large capacity whole home models offered by other manufacturers. A particular point is that this unit is not Energy Star qualified and I am only able to make a qualified recommendation of the 1770A for reasons I explain more fully in my detailed review. The Aprilaire Dehumidifier 1710 is an effective and efficient crawl space and basement unit that is popular with consumers for many reasons, particularly because it is significantly quieter than most if not all of its direct competitors. It is a powerful appliance and its 90 pints per day moisture removal rate makes it suitable for a large basement or crawl space with an area approaching two thousand square feet. Like others in its class the 1710 is fully effective in the cooler conditions prevailing in many areas. It is strong, built to last and comes with a 5 year warranty. This unit has no obvious weaknesses and I am happy to recommend it to you, especially if your first priority is to find the least noisy unit for your home. Despite its excellent qualities there are alternatives to the 1710 which you may prefer once you have compared them. I explain this in more detail in my review of the 1710 which you may find it helpful to read before making your final choice.